Companies used to be able to lock their doors and shred their documents to keep their information from getting into the wrong hands. Then came the digital age - information was suddenly easily accessible and transferrable. To prevent it from being intercepted, stolen or accessed by unauthorized users, security technologies sprouted up to protect it as it flowed through the company’s local area networks (LANs), between their remote sites, and in and out of their discrete data centers. 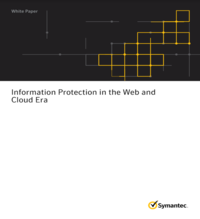 Download a complimentary copy of the white paper: Information Protection in the Web and Cloud Era today.